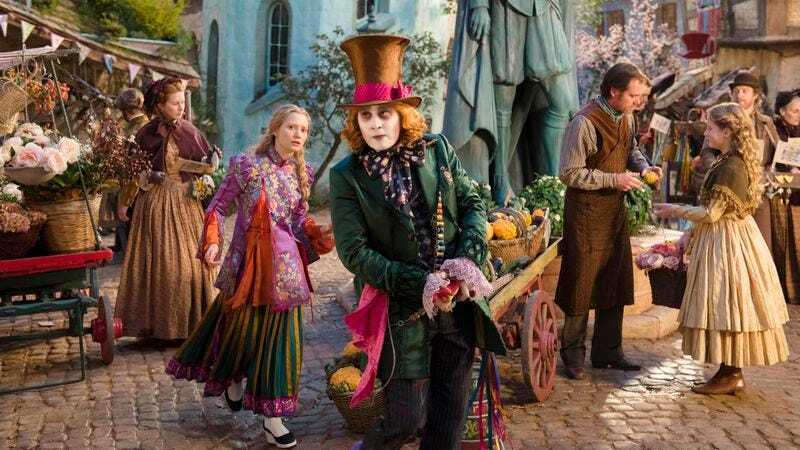 Disney’s version of Tim Burton’s version of Lewis Carroll’s Alice In Wonderland made over a billion dollars worldwide back in 2010, a box office statistic that will forever vex those who mistook Burton spending a little too much time in his wheelhouse for some kind of crime against literature, cinema, and dance all at once. The truth is, Carroll’s work doesn’t particularly lend itself to faithful adaptation, and if Disney’s new Alice series tries to fit his eccentricity into a fantasy-quest template, there’s still plenty of nonsense left to go around (if not nearly enough wordplay). Yes, series: Alice In Wonderland has been made into a sequel, just as the original book was. Alice Through The Looking Glass bears, if anything, even less resemblance to its literary equivalent than did its predecessor (which itself was already a “return to Wonderland” narrative under a more familiar title). Almost the entire cast checks back in, but Burton has moved to producing, while James Bobin takes over as director. Bobin’s version of Wonderland (or Underland, as everyone in the movie calls it) abandons Burton’s water-damaged-psychedelia color palette for a brighter, more verdant look. If the style is tweaked to fit the ending of the previous movie, the technique is similar: This is essentially an animated film with some live-action performers dropped in and digitally augmented in eye-catchingly bizarre ways. As ever, Alice (Mia Wasikowska) is the stubborn voice of reason, both in and out of Underland. The movie joins her as a sea captain in the late 19th century, fulfilling the promise of independence and adventure made at the end of the previous film. She returns home to London to find that her life resembles, well, the setup to a sequel: Hamish (Leo Bill), the grotesquely milquetoast suitor from the previous film, turns up to further repress our heroine, this time by forcing a financial choice between Alice’s ship and her mother’s home. Just like in the first film, Alice escapes Hamish at a snobby party by jumping over to Underland, where she learns that the Mad Hatter (Johnny Depp) has sunk into a kind of dollhouse depression, looking faded and fragile in his conviction that he must be reunited with his estranged, presumed-dead family. To help the Hatter, Alice steals a time-travel device from Time himself, personified by Sacha Baron Cohen as a man-machine hybrid with an Eastern European accent. 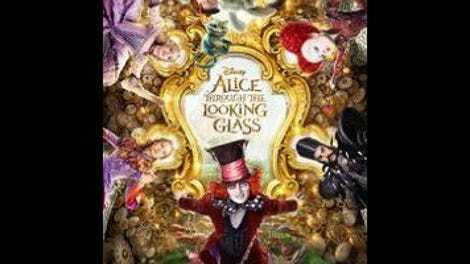 The adventure of Through The Looking Glass involves Alice zipping around the Underland timeline and makes several looking-glass trips in and out of the real world. It’s briskly paced and sometimes neat to watch in reality-bending 3-D, but none of it is quite as head-spinning as it should be. The movie doesn’t dare alienate its family base with genuine trippiness; instead, it pacifies with tedious familial backstory. Alice’s fantastic machine allows her to traverse time and space, all to witness the lame origins of not just the Hatter but also the perpetually furious Red Queen (Helena Bonham Carter) and the more sanguine White Queen (Anne Hathaway). This decision makes Underland feel very small indeed—especially when it’s the surreal mechanics of Time, his clockwork lair, and his little robotic helpers (the Seconds, who can join forces and become Minutes, and so on) that offer the most invention and amusement. There’s less of the latter than there should be, considering that Bobin’s background is in comedy. He came to Disney via his direction of two hilarious Muppets movies, yet his Alice is considerably less funny than Burton’s, less interested in whimsy for its own sake. Apart from the occasional visual tableau, like a computer-generated dolly following the characters as they scramble through the Red Queen’s tree-based lair, succumbing to its branches and traps, Bobin downplays the farce and stays in fantasy maintenance mode. Most of the laughs come from the performers, specifically Cohen’s brusqueness (“Keep your bewilderment brief and to the point”) and Carter’s cruel whims. Hathaway’s White Queen gets her share of screen time but with far fewer lines and almost none of the regal ridiculousness that made her such a delight in the previous film. Depp, too, is central to the story yet not given much to actually do. The famous faces are deployed like expensive special effects: strategically, with the assumption that lingering on them will become too expensive. Sometimes it feels like the supporting actors have lent their likeness rights, rather than given full performances. Wasikowska remains a winning heroine, even or especially when her Alice is making stubborn, potentially wrongheaded decisions. It’s so much fun to see her captaining a ship (complete with a hero-shot zoom intro) or escaping a sanitarium that the non-Wonderland portions of the movie threaten to overshadow the fantasy bits. But even if Disney’s Bobin’s Burton’s Carroll’s Alice exacerbates the flaws of its predecessor, it’s still more harmless than offensive. The Alice pictures represent a livelier retooling of a previously Disney-animated story than the company’s more tasteful fairy-tale adaptations. It’s just a shame that a second-tier Burton movie will apparently stand as the series’ most idiosyncratic entry.